My oh my but I have a thing for the Talleys. I must—I just finished reading Tina Ann Forkner’s Waking Up Joy (Tule Publishing) for the second time. Joy Talley is the 40-something who has tasked herself with preserving her parents’ rural Oklahoma homestead as well as their large, rambunctious, and often complicated family. As one of five creative and opinionated siblings myself, I can relate to their brand of crazy. They may be bossy, hot-to-trot, or off their rockers, but the Talleys are fiercely loyal and never less than entertaining. As the book opens, Joy is in a bit of a spot. After falling from her roof while trying to pull an evil charm from the chimney, and then getting caught in the rope she’d rigged to save her and almost strangling herself, Joy finds herself in the hospital, in a coma, yet fully able to hear her siblings’ judgments about her behavior and their plans to end her life support. Before they do, they spring her and take her to their mother’s funeral, still comatose and strapped into a wheelchair, which results in one of the funniest scenes I’ve read in contemporary women’s fiction. 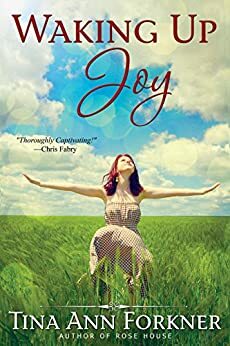 But while this story has voice out the wazoo and oodles of charm, Joy’s humor is a sugary glaze over a darker incident from her past, which ties her to her high school love, Jimmy. She’s kept their secret even though he went on to marry someone else and has continued to wear his wedding band five years after her death. She can’t avoid the big handsome Cherokee in her little town, as he is both mayor and the praise worship director at her church. But whether she should remain true to Jimmy or move on to the younger ER doc who also has an interest—with whom Joy would happily create a scandal—forms a triangle that keeps the tension hopping. She may be a spinster, but Joy Talley is not dead yet. Mercy no. And when these two hunky men come around, she has all sorts of tingles she cannot deny. Family dynamics are at the flaming heart of this story, as know-it-alls, bullies, holier-than-thous, and the unruly next generation all attempt to insert themselves into Joy’s affairs. Fans of Cathy Lamb will love this novel. It’s perfect summer reading—check it out! Waking Up Joy is available to purchase now. Tina Ann Forkner is the author of Waking Up Joy, which was a 2015 recipient of the HOLT Medallion Award of Merit for Romantic Elements, as well as The Real Thing, Ruby Among Us, Rose House, and Nashville by Heart. She lives in Wyoming with her husband and has three children, all in college. Tina is a proud member of Tall Poppy Writers, works as a substitute teacher, and enjoys traveling and hiking. Connect with her at www.tinaannforkner.com. Kathryn Craft is the award-winning author of two novels from Sourcebooks, The Art of Falling and The Far End of Happy, and the author of chapters inAuthor in Progress and The Complete Handbook of Novel Writing from Writers Digest Books. Her work as a freelance developmental editor at Writing-Partner.com follows a nineteen-year career as a dance critic. Long a leader in the southeastern Pennsylvania writing scene, Kathryn leads writing workshops and retreats, and blogs at Writers in the Storm and Writer Unboxed.